The three museums I have recently reviewed are all in Hakone, a mountainous area west of Tokyo where there are lots of hot spring resorts. T and I went there during Christmas. It’s a popular weekend getaway for Tokyoites because it’s only an hour away, and there are many hotels with hot springs and baths to soak away the urban detritus. The way hot springs are enjoyed in Japan is totally different than in America. First, Japan has lots of them because of all the geothermal activity, one of the few advantages of being in earthquake country. In the US, there are few. In fact, they’re quite rare. In Oregon, there were some hot springs around Eugene, and the most popular one is the Cougar Hot Springs. But you have to drive over an hour on some mountain roads. Then you have to find the landmarks that lead you to the dirt road. Go on this dirt road for a while until you come across a makeshift dirt parking lot filled with out-of-state cars; I rarely saw one with Oregon plates. Hike into the forest a bit until you emerge in a clearing. What you’ll see is a series of pools, each one progressively cooler than the one above. There are lots of naked hippies soaking, playing music, smoking weed. It’s actually a pretty fun scene. 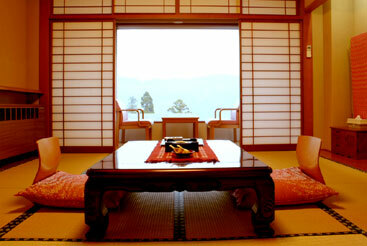 But the Japanese hot spring experience, called onsen, is much more refined. The onsen is not just a hole in the ground, out in the middle of nowhere. The hot water is pumped up from underground, channeled into a bath area with outdoor and indoor pools. The area is nicely landscaped. And they are separated for men and women. The bath areas are part of a hotel. Often a luxurious meal is served in your room. Then people come in to put out the futon. Guests pad around the grounds in yukata, which are like bathrobes. Instead of just hopping into the hot water, bathers are required to clean themselves before entering the pools. The baths are not for cleaning, just soaking. Then you chill out with a pool full of naked old men. Most of the time though, if you go during the off-season or the middle of the week, it’s quite empty. T and I actually were able to have chats with each other over the wall because there was no one. Each onsen has it’s own mixture of minerals. Hakone has cloudy yellowish water, heavy on the sulfur. 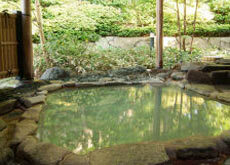 Hot springs in Tokyo usually have a clear reddish tint due to the abundance of copper. I think I remember Izu had a greenish hue. They all work the body in their own way. Like a local wine, each one has its own personality and medicinal qualities. While it’s an interesting adventure trekking out to a naturally formed hot spring, I’d rather have the onsen experience. Either way, hot mineral water feels good and I’ll soak in one anywhere. Photos are from the hotel website. Wind, there are many developed hot springs in the U.S. In California, there are a number in the vicinity of Clear Lake — Wilbur Hot Springs, for instance. Also, there’s the Desert Hot Springs Resort (near Palm Springs). There are many more. In Colorado, the little town of Ouray has a great public pool fed bed naturally hot water. It’s a good place to get snowed in. There are also private resorts. It’s just over a little hill from Telluride. ahh, never knew about these places. i’ll definitely have to visit. i guess oregon is a bit behind in developing its hot springs. but to put it into perspective, just the Hakone area that i’ve been writing about has hundreds of developed hot springs. and that’s just one area of Japan. the Izu Peninsula and Nikko, both near Tokyo, also have hundreds. and even inside Tokyo, there are dozens that i know of. so the scale, sophistication, and affordability way outpaces any american offerings. on the other hand, there’s a certain charm to trekking out into the woods for some muddy holes to soak in.